Almuerzo en la espectacular ciudad costera de Positano. Pasa un tiempo en el tranquilo y hermoso pueblo de Amalfi. Great service. Victoria arranged for a local guide at the Pompeii ruins who was informative and entertaining. Victoria also recommended a restaurant at Amalfi Coast which was absolutely heavenly - the views, the service, the food were impeccable! My mom and I took this tour, ANDREA our guide who at the same time was our driver is a very nice men, very caring, drives carefully, very nice person, speaks English perfectly well. As if we had a body guard, he stayed with us all day, when I was trying to buy souvenirs he helped me and started bargaining with me. My mom needed to enter the bathroom, he paid for it and never accepted to take the money back. The tour overall was amazing, actually more than I expected, our first stop was at Pompeii, an English speaking guide was waiting for us, Pompeii is a must see destination. After Pompeii, Andrea took us to Amalfi coast and to Positano, two incredibly beautiful islands, we had enough ti,e to buy souvenirs and to take wonderful pictures. Your trip to Italy will be without a meaning if you don't go to Pompeii and to these beautiful islands. Thank you dear ANDREA for making this trip an unforgettable one, God bless you. This tour was exactly what we had planned it to be. Since we were not able to incorporate more time in southern Italy on this trip it gave us a chance to see Pompeii, the towns of Amalfi and Positano where we had a great lunch thanks to the recommendation of our very wonderful driver Andrea. Andrea also took us on the famous Amalfi drive along the gorgeous coast which was a definite on our bucket list. The weather was clear and sunny and Andrea's expert driving and care for us stopping at beautiful look out areas was exemplary. His care for us as we toured was very dedicated and focused. This was a very long day starting early in the morning along with an ambitious itinerary that was made easier by his recommendations. We feel that it was a good trial run for our future visit to southern Italy. And if you get the chance to have Andrea as your driver so much the better. This tour was the highlight of our stay in Italy. Our tour guide was superb. We were scheduled to be in a small group of six, but my wife and I were the only ones on the trip. So, effectively, we had a private tour, and our guide was knowledgeable, friendly, articulate, and caring. Easily an A.
I would give this tour 10 stars if I could. Absolutely a day and a drive that our family will never forget. Our guide, Victoria, was absolutely amazing and made sure our day was perfect. She was very knowledgeable about Pompeii and the Amalfi Coast and obviously is very proud of her country as she should be as Italy is amazing. She was an excellent driver and I can't say enough about how wonderful this trip was. We ended up having a private tour and it was so worth the money! Perfect day and tour!! I was initially nervous about doing this tour because I did not get the final pick up time finalized until the day before. The tour company called my hotel with the time. I believe the reason for the delay in time was because they were waiting to see if other people were going to join the tour. In the end, it was just my partner and I, which was pretty awesome. Our guide was Victoria and she was fantastic! She is a great driver, funny, and really easy to talk to especially about Italian culture. We drove from Rome to Pompeii first. It was a long drive and felt like 3 hours or so. When we arrived, we joined another tour group fairly large and Victoria tagged along. It was skip the line. The tour for Pompeii was really funny and she pointed out the highlights of Pompeii. Victoria also told us about parts of Pompeii. We could have explored more, but it was too hot to stay too long. After Pompeii, we went to Positano. The roads were insane and I am glad Victoria knew how to drive through the windy roads. Parking was almost inevitable because of peak season. We had free time for about an hour and we went to a restaurant recommended by our guide. We couldn't go to the Amalfi town due to forest fires, so that was disappointing. The ride home was incredibly long due to traffic from people coming from the beaches and waiting in the tolls. This was the only tour for Pompeii and Positano that was available on Sunday that I found. I believe it is because they are willing to deal with the heavy Sunday traffic, which I am highly thankful for. I really recommend this tour because you really get the private, exceptional experience and an informative guide. This was amazing! Beautiful Amalfi coast, amazing Pompeii, and very informative guides! An unforgettable way to spend the day! Our guide, Victoria, was great! She was so friendly, knowledgeable, and just the right amount of information, so that we could enjoy the breathtaking scenery at our leisure. Fabio was our driver, he made us safe and comfortable the whole ride. We had 2 other couples in our group. Shout out to the lovely Danish couple! About an hour into the drive, we stopped for a quick coffee and a bite. 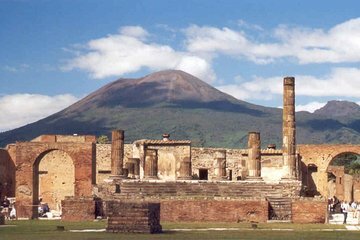 Then Pompeii. Brilliant, innovative civilization! Next Positano. Stunning. Quick lunch. Final stop was Amalfi. Because it was the day after Easter, it was a vacation day in Italy, and there was a lot of traffic. It left us with 30 minutes in Amalfi, which we spent to buy limoncello goodies to bring back home. So glad we booked!